Snack Girl needs to apologize to all her Canadian and other international readers. She is OBSESSED with American Thanksgiving. I can’t help myself because I want to make it easier for everyone. How many of us have slaved for hours over the stove, sat down for an hour, and got up and cleaned for hours? I know it is my own fault for buying those nice wine glasses you can’t put in the dishwasher but sheesh! Earlier in the month, I posted about roasting turkey breast and I got schooled (see: Roasted Turkey Breast Recipe). It seems that many readers are using a Reynold’s Turkey Bag for cooking turkey. We roast turkey breasts several times a year. I actually roast 2 or 3 for Thanksgiving instead of the whole bird. My tip is to use oven bags. I use them every time and the meat comes out very moist. I also agree a meat thermometer is a must, those little pop up things aren't very accurate. And then a whole bunch of other readers chimed in. I have to admit, I hadn’t even heard of the oven bags. I went to Stop & Shop and they were everywhere – how could I have missed them? I was shocked to find out that they were made of plastic (food grade nylon to be more specific). The FDA has approved its use so it is supposed to be safe. I don’t want to argue about whether the FDA is right or not because I have no idea. What I will say is that if you aren’t eating turkey cooked in plastic every day –I doubt you will die from plastic residue. I have no data to support my view of course. Back to the bag – you put one tablespoon of flour into the bag – add the turkey – close it with a plastic tie – and cut a few holes in it. The process is easy if you have two people, one to hold the bag and the other to put the turkey in. I found that this method cooked my turkey breast an entire hour faster than without the bag. The meat was moist and cooked perfectly. I followed the instructions for the timing on the Reynold’s website and it was spot on. The skin gets crispy but not as crispy as the roasting pan method. I cooked a 10 pound turkey breast in 2 hours. Wowza. Clean up? This is the number one reason to use the bag. I pulled the turkey out and then I could pour the juices into a measuring cup, drain the fat, and make gravy. No pot scrubbing! I think the bag is great for newbies to cooking turkey and for people who are just plain busy (like me). For those of you who don’t want to cook in plastic - you can use the Martha Stewart Cheesecloth method for ensuring that the breast is moist when cooking the entire bird. I hear through the foodie grapevine that this method is fool proof. I found that roasting the breast alone and taking it out when the thermometer hit 165 F ensured that the meat was moist as well. The dark meat, white meat combo is more difficult. Enough! I will stop musing on cooking turkey. Really. Please share your turkey cooking experiences. We've always used the Reynolds bags ever since I can remember. Makes the turkey wonderful! I haven't used the bags, but they seem like a good idea for easy clean up. I like to brine my turkey and then cook it upside down. The breast stays moist and the dark meat cooks beautifully. It's not a pretty bird for presentation but you can't beat the moist meat. And a meat thermometer is a must! I will admit, I only started using oven bags a few years ago. I don't stuff my turkey (or chicken) so this just made cooking so much easier. I'll also sing the praises of the oven bag for spiral sliced hams. They can come out dry, but not when you cook them in a bag! Yes the bags make the turkey juicy. I have used them for many years for turkey, ham, and whole chickens. Not only that they make clean a whole lot easier. Nothing sticking to the pan. Better than that are the Perdue chicken breasts that come ready to pop into the oven. Your hands never touch chicken. You just make a one inch slit in the bag and put it in a pan. Super moist chicken is done in 90 minutes. I buy 6 at a time and pop them in the freezer. Cook frozen for 2 and 1/2 hours. The whole roasters work the same way. I will never touch raw chicken again. Basically, spatchcocking is a method of preparing the chicken for cooking. The method involves removal of the backbone from tail to neck so that the bird can be opened out flat (also referred to as butterflying). This method results in a shorter cooking time. It also gives easier access to the cavity and exterior of the chicken for seasoning purposes. I am Canadian, and I say - absolutely no worries about your Thanksgiving, many of the ideas you shared I would use for Christmas time, so please - carry on! I always cook 2 turkey's each year. I have been using the reynold's bag for years. It is such a time saver. I add onions in the turkey cavity and mix a bunch of seasonings in a small Dixie cup. After putting alittle olive oil on the bird, I then tuck my hand under the plastic and sprinkle the seasoning all over the bird. You can also rub some in, then sprinkle some more. When it is done cooking it does look nice and brown because of the seasonings. My family raves about this method. I would never go back to tenting and basting, NEVER! I always use the turkey bag and even converted my mother in law to this method. I usually host two family gatherings each with an 18+ lb bird. Luckily my husband usually helps "load" the bird into the bag. KIM: I did see Alton Brown butterfly a turkey and cook it directly on the oven rack above roasting veggies. It looked wonderful, but I was worried about losing all of those wonderful juices for my gravy and noodles. BARB: I have never brined and the turkey is juicy and delicious. If you go that route, let us know how it works! My job as a child was scrubbing the roasting pan - and it had to be scrubbed until it looked like new. I never use a roasting pan - double up good quality foil pans and they work like a charm. Even though the bags are considered food safe, I wonder what is actually leaching into the turkey? My answer to moist turkey? Once done, cover the entire pan with foil and drape it with a bath towel for at least 30 minutes, and as long as an hour. That helps the juices settle. My turkeys are never dry. I'm so glad you posted on this. 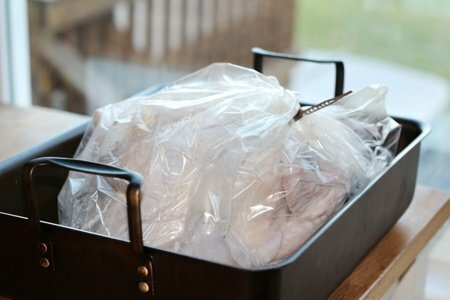 I would love an easy clean up, fool proof moist turkey but I am also concerned about cooking in plastic/nylon. Does anyone have some information or references about this? My boyfriend always brines the Turkey for at least 24 hrs. (and he doesn't stop with the turkey)you will love the moist, juicy meat! Happy Holidays all! The bag is awesome. I cooked a turkey once with my mom and we used the bag. My mom also injected it with a paste she made from various herbs, garlic, oil and water. The bird was flavorful, meat was falling off the bones and the breasts were juicy. I could use the bags for when i roast chickens but instead i flip them from breast to back every 20 minutes till done. We could talk turkey everyday from now until Thanksgiving, it does something good for my soul. Plus I love reading everyone's comments, receipes & suggestions. Although I get stuck trying to figure out which receipe & which method to try. I've actually only have ONE whole turkey. That was 2 yrs ago & it was....well fantastic to look at & to eat. But for the life of me I can't remember exactly what I did. I had been sick with pnuemonia for 3 months, was drugged up & probably delirious. How that turkey came out so delicious will always be a mystery. I even took a picture so I could rememeber it, I was so proud. Lol. Anyways please keep the turkey talk coming, along with all the other yummies to go with it. How about cranberry sauce receipes? Oh one other thing. SnackGirl, your new pi cture up in the corner is wonderful. You are a perfect example of a healthy & happy woman. I love using the oven bags. Turkey comes out moist and clean-up is a breeze. FYI......Reynolds also makes a liner for your crockpot! Cooking bags are a must! Brine away and still use a bag, it's amazing! I do this too. I love the bag for turkey or for pot roast cause it keeps the protein so moist. I think its because the marinade turns into a steam sauna for the protein so it a gentle type of roasting process. So yummy. This year its just me, so I have a brined Chicken that I got from Trader Joes and I'm using my Nuwave oven.